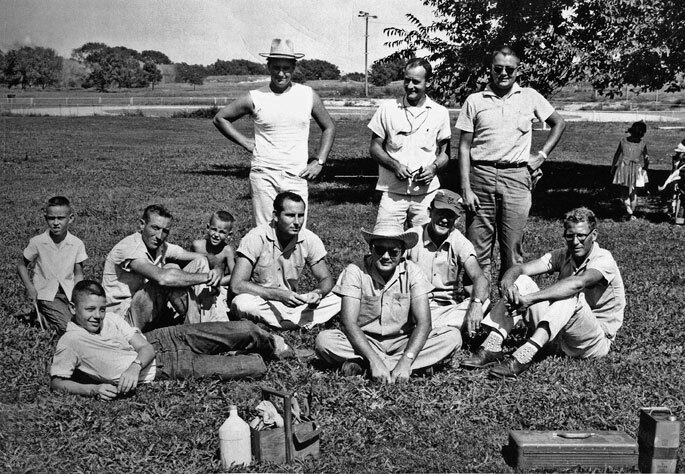 Editor's note: This is the second in a series of Flying Lines interviews with American pioneers of control-line Combat. 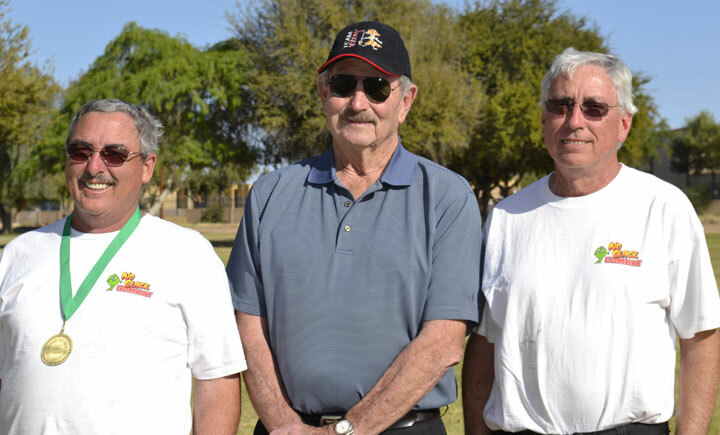 Combat legend Riley Wooten, flanked by Andy Mears (left) and Bobby Mears. When Combat was just called Combat and cars had fins, the big daddy of them all was Riley Wooten. He was the guy who was in front of the camera for his drive and abilities; he was and still is no shrinking violet. Riley won combat at the U.S. Nationals when there were substantial numbers of contestants, and single round elimination -- 1956, 1959, 1962, 1966, 1967, and 1968. Riley was an all-around athlete steeped in football, track and a championship basketball team, so as a kid, he was no stranger to competition, he took that winning drive with him throughout his life. 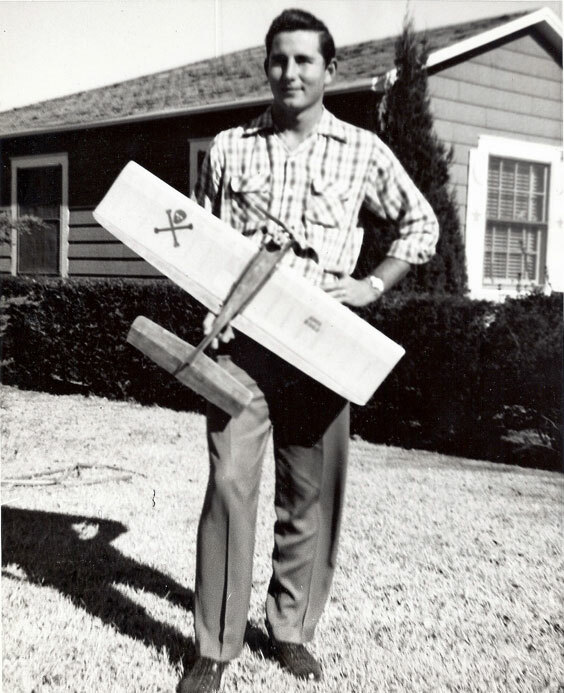 Riley began his love of aircraft, at age 6 or 7, by carving solid wood models from crate wood. He would sell them for 15 cents to a woman who would then sell them for 25 cents. Airplanes were a fascination to Riley who had an uncle living in San Diego and flew model airplanes. 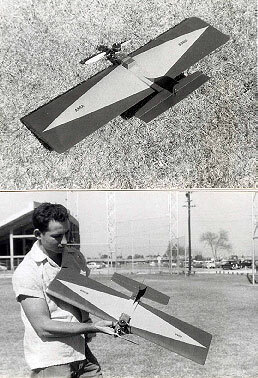 The model he recalls was a Super Duper Zilch that flew using a drone diesels engine. 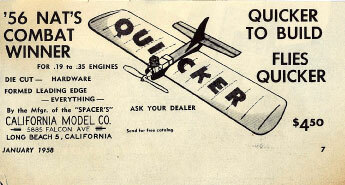 In 1948, he owned a Comet Trainer that used an ignition engine. 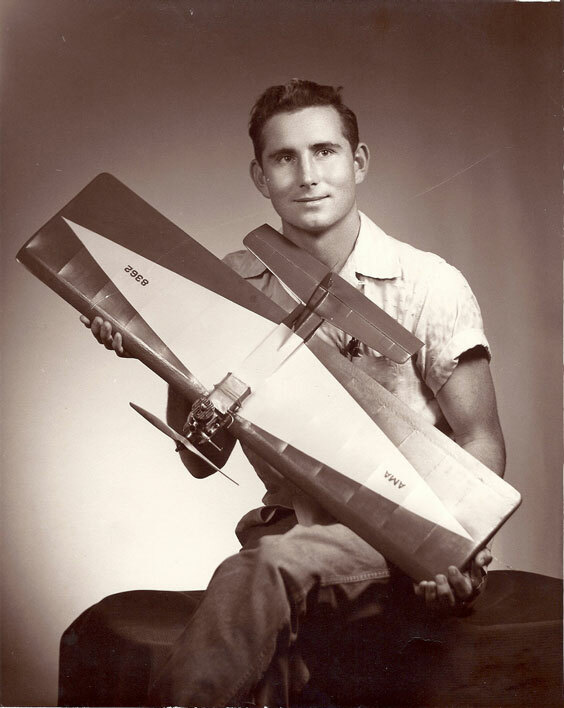 To Riley, nothing could match the sound of a running engine and after watching local flyers start their models, he saved his money, bought the engine and built the airplane. Model airplanes were not a big part of Riley's life in high school, maybe third or fourth on the list. Sports, girls, cars, the usual things that guys go through took a higher priority. KB: How did you discover combat? RW:	I went to Reece Air force base in Lubbock and saw an actual contest. I was watching stunt first, but then was noticing there were guys flying Ringmasters with streamers behind a one foot string (yes, 12 kill zone) The Ringmasters had no landing gear and that was all it took, combat became my ambition. KB:	Who influenced you then? RW:	A guy named Loftest turned out to be the local combat hot-hand, I learned of this and was matched against him at my very first contest, we were rematched three times before he finally could beat me. That was my first competition and I had an idea that I could do this. KB:	How did you progress? How did you become the Riley Wooten we all read about? RW:	I became a student of combat, I studied as much about aerodynamics as I could and began to experiment with things. Airfoils, smaller, lighter airplanes, it seemed there was a new airplane every week. I rarely had drawings, I just made new ideas. RW:	The Quicker was a big hit and a good flyer. A guy named Carl Berryman showed up once with a Half Fast around the mid 50's and lost. He however was adamant about wanting the plans for the Quicker because it flew so well. ... I said I didn't have any, there were none. He persisted. RW:	Yes, but not in a bad way, he just really wanted to learn more. I invited he and Barbara to the house and our wives got along well, heck, they even made us dinner. I made a simple drawing of the Quicker on some butcher paper for Carl and we became friends. KB:	Carl told me you could read a flyer like a book, how did you do that? RW:	I would watch a flyer and if he was aggressive, I would be more aggressive, if he flew defensive, I would do it even more than him. In other words, I would take them out of their comfort zone by beating them at their own game. KB: The Voodoo was maybe your most famous airplane? RW:	Yes, Carl Goldberg wanted a tamed down version of it so everyone could fly it. KB:	So the voodoo that I built was not like the ones you built? RW:	No, mine were much lighter and I played with the airfoil a lot. 18% to 25% and all the ones in between. They had carved out leading edges that tapered. Not very much like the Goldberg kit at all. KB:	You made the first production foam airplane that I knew of, the Vampire. RW: Yes, in the 1960s we tried all sorts of things to get combat going. Airplanes like the Demon, the Vampire, a kit that the average flyer could get going in combat with ... simple and fast. KB:	Who were your favorite fliers? RW:	That's a tough one. ...It was said back then, that the road to the Nationals goes through Lubbock. We had quite a bunch in those days, still do for that matter. Carl Berryman and James Mears, and the Huston boys were all very good. There were so many of them. Howard Henry, Pete Jaden, Bentley Page. All very good combat flyers. One match that I was particularly proud of happened at the Chicago Nats. I think Carl and I were pitting for each other. KB:	So the match was with Carl? RW:	No, it was some guy from Detroit who got a cut then sat on the ground to try and get the win. The rules in those days were different and I knew what to do. I could turn sharp enough to snap the string off of my wing and thus stop the clock. I kept this up for quite a while until we were rematched. I looked at him and said. I'm gonna stick you in the ground right there, and pointed to a spot. KB:	C'mon -- what happened? RW: Well, I got him to follow me and sure as we are talking, I shook him into the ground right where I said I would. We got along better after that. KB:	When did you stop flying combat? RW:	After I won the Nats in 1968. I was pretty busy in those days; I still liked it but just had too many business commitments. KB:	What music did you listen to back then? RW:	Willie Nelson, Waylon Jennings and Ray Charles. KB: What do you do nowadays since you retired from Lone Star Balsa. RW:	I sold my full-size airplane a few years ago and really miss it! Mostly I enjoy the lake where I live and a cabin in the hills of New Mexico when it gets too hot. I have been making some drawings of old models. ... I still have my '99 Corvette. KB:	Did you see the Combatt Graffiti video? RW:	Yes, fast cars, pretty girls and combat wings -- perfect. 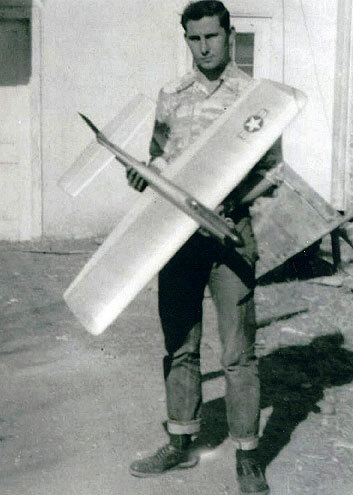 A Vampire built by Pet Jaden, flown in combat in 1966. Riley Wooten and his Quicker.